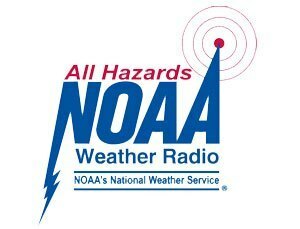 NOAA All Hazards Weather Radio (NWR) is a national network of transmitters that broadcast continuous weather and hazard information directly from National Weather Service Offices in your area. NWR broadcasts official emergency disaster information, weather service warnings, watches, forecasts and other hazard information 24 hours a day, 7 days a week. These broadcasts can only be received by radios that support the NOAA Band. Normal weather messages repeat every 5 minutes and are updated about every 2-3 hours (more frequently if conditions are developing). To read more about NOAA Radio, Click Here.